After more than 300 years of peace, the four nations of Trionfey prepare for battle. Choose between power, magic, wealth or knowledge. Become the hero of your nation, wield your armies, collect artifacts, and lead your nation to victory! An official deck complete with lore is being developed for Fano. To see the artwork and stay tuned, follow Fano on Facebook or Instagram! Fano is a new strategy card game that can be played with 2 or more players. The object of the game is to promote (see promoting) your commander three times before your opponent(s). A player can promote by collecting and sacrificing their nation’s three prestige cards. This can be achieved by strategically attacking, combining, and playing cards to counter and outmaneuver your opponent(s). For additional instruction, check out the video tutorials tab for videos on how to play Fano. Combat cards: Play or use Combat cards (ace, 2, 3, 4, 5, 6, and 7) in all aspects of Main phase and end of turn. Prestige cards: All three prestige cards (8, 9, and 10) are needed to promote and win. You may play them only by combination. Commander cards: The commander cards (J, Q, and K) only mark your progress through the game. Pick a suit (hearts, clubs, spades, or diamonds). Place their commander cards stacked face-up in front of them, jack on top and king on bottom. Shuffle their remaining cards to form their draw pile and place it next to the commander pile. Leave room so that each player will have space for a discard pile and four field slots. Discard pile: Fan out all cards placed in the discard pile so that your opponent may see all face up cards. Field slots: The four field slots may only be occupied by combat and prestige cards. When all field slots are full, a player can make room with in game actions. Every turn consists of three phases: draw, main phase, and end turn. At the start of your turn, draw up to three cards. If your draw pile runs out of cards, shuffle your discard pile and continue until you have three cards. During your draw phase, if you have the 8, 9, and 10 in hand, you may choose to keep or discard the hand. If you discard the hand, draw three new cards. Combine: You may play a combat or prestige card from your hand onto the field if you sacrifice two cards in play that sum to the value of the card in hand. After combining, you may return up to one of the sacrificed cards to your hand. Any cards not returned to hand are sent to the discard pile face-up. *Example* Play a 7 by sacrificing a 6 and an ace(1) in play (6 + 1 = 7). Attack: You may sacrifice a combat card on your field to remove an opponent’s combat card from their field. In order to sacrifice your card in this way, you must replace it with a specific combat card from your hand. Not just any sequence of 3 combat cards will work. In the image below are the 7 attack cycles of Fano. You may perform an attack: your card -> opponent card -> card in hand as long as it follows one of the 7 cycles in a clockwise direction. The first two cards removed go to their respective discard piles face-up. *Example* If you have a 2 on your field, the 2 can attack an opponent 3, 4, or 6 but would require a 5, ace, or 7 in hand respectively. If you used a 2 to attack an opponent’s 6, the 2 and 6 would go to discard and the 7 (in hand) must be played. Promote: If you have the 8, 9 and 10 in play, you may advance to the next commander by sacrificing them. When the 8, 9 and 10 are sacrificed, send them to the discard pile face-up. If you were a Jack, become a Queen. If you were a Queen, become a King. And if you were a King, you win the game. You can shorten games by stopping at Queen or King. 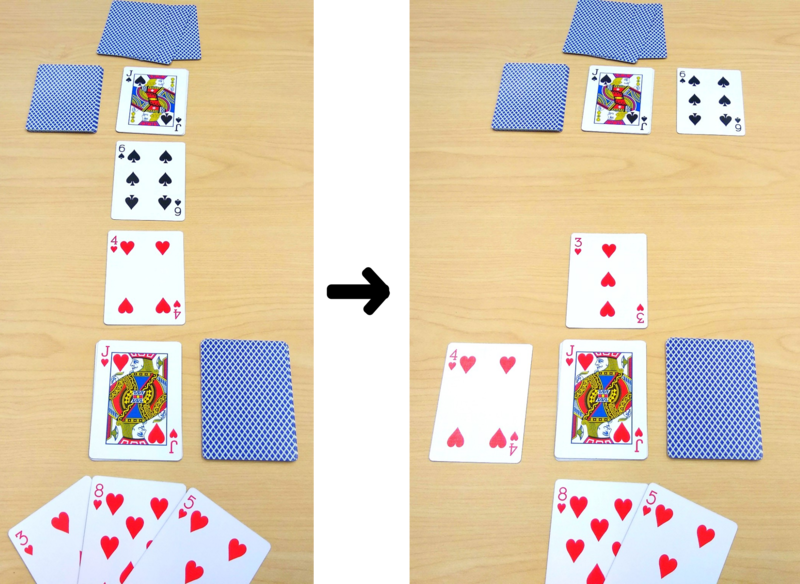 Using the fano plane: In Fano the card game, we use the fano plane (left) to create 7 unique rock-paper-scissors attack cycles (right). Just like the rules of RPS: paper -> rock -> scissors, attacking in Fano is the same: A -> 2 -> 4. The fano plane ensures that all 7 combat cards can attack 3 of the other 6 combat cards and be attacked by the remaining 3 combat cards. For additional help, see the YouTube videos on attacking. Play card: Play a combat card into an empty field slot. Substitute: Discard a card in play before replacing it with a combat card from hand. Discard: Discard any number of cards from your hand face-down. When you promote three times you win! Fano can be extended to any number of players. For 2-4 player games, only one deck is required, while 5+ player games will require additional decks. In multiplayer games, a player attacks to their left. When playing with an even number of players (4,6,8,etc.) split the group into two partnerships of odds vs evens. Each partnership will perform their turn at the same time. When playing with 5 players, one way to decrease playtime through partnership is to have an alternating partnership. For instance, in a 5-player game, player 1 and player 3 will perform their turn at the same time. Then player 2 and 4 will perform their turn. The remaining sequence would be 3 & 5 -> 4 & 1 -> 5 & 2 before it comes back to 1 & 3. Alternating partnerships can be achieved with 7-player as well however, 3 people need to go at the same time: 1,3 & 5 -> 2,4 & 6 etc. (Spades) Jokers wild: During your main phase, you may trade in 3 tribute counters to place a joker onto the draw pile face up. The joker is wild and can enter play as any combat card. The joker can be the result of an attack, combination, or even be played at the end of turn. The joker can be used as a normal combat card with the exception that if a joker were to be sent to the discard pile, instead remove the joker from the game. This special enables same value combinations for example: 4+4, 5+5, etc. A joker may not be returned to hand as a result of combination. More than one joker may be placed on top of the deck if the player spends 3 tribute counters for each joker. (Hearts) Reverse fano: During your main phase, you may trade in 3 tribute counters to reverse the direction of the attack arrows for one attack. Normally combat cards can attack 3 of the other 6 combat cards. With this special, a card can attack any number. For example, 3 can normally attack a 4 for a 6 (3 -> 4 : 6) but the special will allow the 3 to attack the 6 if the player has a 4 (3 -> 6 : 4). In multiplayer games, this special can be used to attack either adjacent player (including counterclockwise). In multiplayer, if a player uses this special to attack counterclockwise it costs 4 tribute counters instead of 3. (Clubs) Oversum: During your main phase, you may trade in 3 tribute counters to combine any two field cards for a card value less than the sum of the combined cards. When a player combines using this special they are not rewarded a tribute counter. For example, a player can combine a 5 and 6 for any combat or prestige card. (Diamonds) Perfect defense: During your end turn step, you may trade in 3 tribute counters to play a combat card face down. The face down card can not be attacked while it remains face down. The player can flip the card face up any time during their main phase. Once the card is flipped face up, it can be used to combine or attack but will remain face up until it is removed from the field. During the opponents turn, if the opponent were to attack another card, the face-down card can be used as a surrogate in place of the attacked card. If used in this way, the opponent's attack proceeds as normal; however, the face-down card will be sent to the discard pile face-down instead of the attacked card. Hearts has a 4 in play and their opponent (spades) has a 6 in play. Hearts may attack the 6 of spades with their 4 if they have a 3 in hand (4 -> 6 : 3). When hearts attacks, their 4 and the 6 of spades are sent to their respective discard piles and the 3 of hearts is placed onto their playing field from hand. Combining can be used strategically to set up a subsequent attack or a second combination. In this example we will see why you may want to combine for a combat card (ace-7). It is hearts turn and they have an ace and 4 in play while the opponent (spades) has a 3, 6, 8, and 10 on their playing field. The hearts player is pretty certain spades has the 9 in hand, which is the last prestige card they need for a promotion and a win. Hearts draws and their hand now consists of 2, 5, and 10. At first glance, hearts can not attack the 6 or the 3 of spades with their ace or 4. However, hearts can combine the ace and 4 for the 5 (in hand) and return the ace to hand. Now hearts can attack the 6 of spades with their 5 (5 -> 6 : ace). The 6 of spades and the 5 of hearts are sent to their respective discard piles while the ace of hearts is placed once again into play. This move prevents the opponent from winning the game next turn at the cost of the 4 of hearts. In this example we will see how a player can combo attack/combine 3 times to draw a new hand. To start, hearts draws up to three cards and their hand now consists of 4, 3, and 8. Hearts already has an ace, 5, and 7 on the playing field. Their first instinct might be to combine the ace and 7 for their prestige card in hand (8). However, they take a step back to examine the opponents (spades) playing field. The opponent has a 2 and 6 of spades in play and may be wanting to combine for an 8 next turn as well. Instead of combining ace and 7 immediately for their 8, hearts chooses to attack the 2 of spades with their ace. The attack removes both cards and hearts replaces their ace with the 4 in hand (1 -> 2 -> 4). Next, hearts attacks the 6 of spades with their 4, removing both cards and replacing their 4 with the 3 in hand (4 -> 6 -> 3). Finally, hearts combines their 5 and 3 for the prestige card (8) in hand. Hearts chooses not to keep either of the combined cards which prompts them to draw 3 new cards and continue playing. This sequence of moves not only results in the prestige card (8) but also seriously damages the opponent’s playing field--removing all of their cards and preventing them from combining next turn for a prestige card.